Martin Olivier, a senior scientist from the Infectious Diseases and Immunity in Global Health Program at the Research Institute of the McGill University Health Centre, has recently shown that a virus that infects a primitive type of cell – the Leishmania parasite – also has a ruse to avoid detection. Image caption: Leishmania exosomes (left) are used by the parasite for communication purposes. The Leishmania RNA virus 1 (center and top right) uses the exosome in order to gain an envelope and avoid detection. 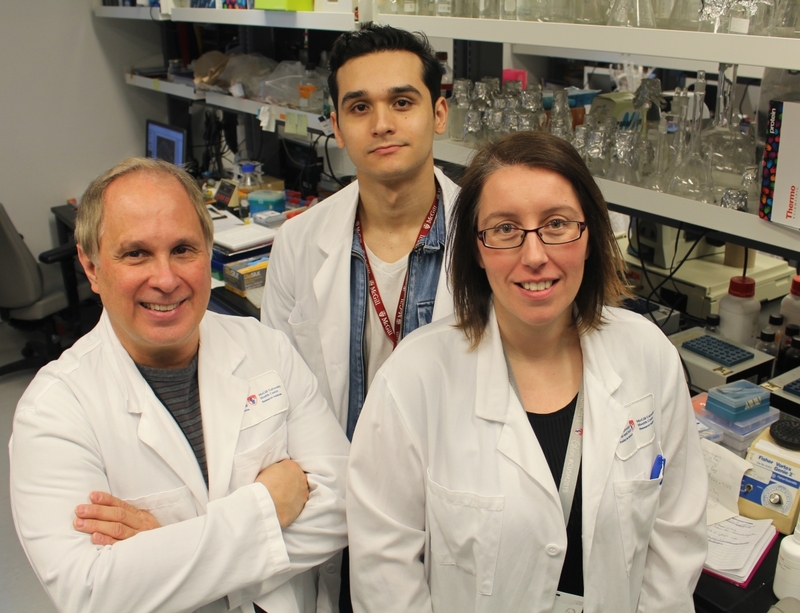 PHOTO (L-R): Martin Olivier (Principal Investigator) with Alonso da Silva Lira Filho (PhD student) and Caroline Martel (Research assistant) in their laboratory at the Research Institute of the McGill University Health Centre.